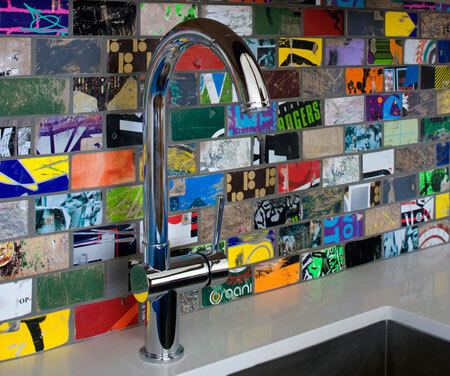 Art of Board tiles are hand cut from 100% recycled skate decks and sold by the square foot. Every scratch, scrape and gouge is kept in tact – making them truly original. Each tile has its own story. They’re alive with texture, shape and color. Together, they bring that story to life in every space they inhabit – creating a vibrant visual experience in the home, retail or commercial environment. I wouldn't necessarily use these tiles in my home, but I love the idea of using them in a skate shop or certain retail spaces. I really do like the creativity of turning something that was broken and destined for the dump into a useful design element. Love for a retail space or funky basement kitchenette.